The Bulls went into this season believing they had a pretty good chance with three All-Stars, Derrick Rose, Luol Deng and Joakim Noah. It’s difficult to say, even though you’d get an argument from Bulls coach Tom Thibodeau, that the Bulls had an equally good chance Monday against the Minnesota Timberwolves with Taj Gibson playing center for the ill Noah, Mike Dunleavy for the traded Deng and D.J. Augustin for the injured Rose. Sort of, as the Bulls did get within 84-79 on an Augustin three with 1:29 remaining after trailing by a dozen points earlier in the fourth quarter. But All-Star starter Kevin Love with 31 points made a layup on a roll to the rim with too late help, Jimmy Butler missed an off balance 10 footer and Corey Brewer, as he likes to do, snuck down court for a clinching dunk. At least he believes he can. And he pulls it off more often than anyone can expect. Though I think it’s houndstooth socks for Thibodeau instead of the houndstooth hat. But this was asking an awful lot with Kirk Hinrich still out as well with a hamstring injury. The Bulls got 20 points and 14 rebounds from Carlos Boozer, 19 points and six assists from Augustin and 16 points and eight rebounds from Butler. It’s one thing to take away Rose’s scoring and threat that draws defenders. And then Deng’s cutting and activity that also occupies the defense and opens the floor for teammates. And then there’s the Noah effect, which provides protection at the rim on defense and rebounding, an offense that cannot leak out trying to make sure to keep Noah off the offensive boards, the back door cuts and bounce passes that produce layups and the pick and roll Noah has run beautifully with Augustin that has produced easy points. The Bulls pride themselves on being the no excuse, next man up, we’ve got more than enough, do your job, don’t let go of the rope — whew, I’m running out of clichés — team. And it seemed no coincidence once again even with Noah also missing that the Bulls were able to stay close with their effort and defense, though only close as they shot 37.6 percent, were outscored by 10 in the paint and run down on fast breaks 22-7. The Bulls did hold the second highest scoring team in the NBA almost 12 points below its season average. So they did give themselves a chance. But everything has to go right with four of the top six players from opening night being out. Not enough did. And thus comes the challenge as the Bulls fell back to .500 at 22-22, though still 10-4 this month. They open their last long Western Conference road trip of the season Wednesday in San Antonio, six games over 12 days when the Bulls may not be favored to win once. This team is familiar with adversity, one of its favorite words, sort of the start of every day. Let’s see, some orange juice, a doughnut and some adversity. This time it was with Noah missing the morning shootaround ill, coming to the game but then being sent home to try to get through his illness. Heck, the guy dresses warmly. He’s always wearing a stocking cap in the locker room. I guess they don’t have winters like this in France. 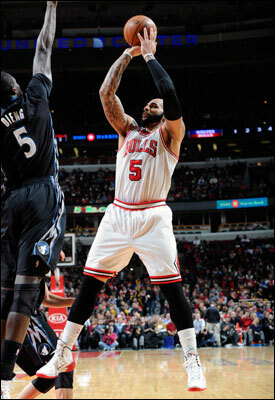 Boozer recorded 20 points and 14 rebounds, but the Bulls fell back to .500 at 22-22, though still 10-4 this month. Anyway, without Noah the Bulls went to their 18th different starting lineup this season with Gibson and Boozer up front. They work at it, but the big rebounding and second chance point edge also is gone without Noah. Nazr Mohammed played well with nine points and five rebounds, though the Bulls with most of their reserves starting got beaten badly off the bench 35-11. The Bulls then went on to lead for a total of 33 seconds, the first 33 seconds of the game until Love made a 20 footer to tie it at 2-2 (how about that for breaking down the early action). Boozer then had a miss and a miscue and then Noah’s U. of Florida teammate Brewer spun inside for a 4-2 lead and a lead the Timberwolves would never relinquish. Good night’ drive home safely. Yes, there was more. But this game had that inevitability feel to it. Perhaps as well to those playing it. Despite the obstacles, the Bulls players never give in or give up. But they seemed to sense this hill was more Everestian. Not that the Timberwolves are as frightening than even their name. They also are 22-22 and lead the league in losing close games. It would have been entertaining if the Bulls could have gotten one or two more defensive plays down the stretch and made the Timberwolves make a big shot. Love can, but the Bulls did a good job on him after he had 17 points in the first half by sending whomever was guarding Ricky Rubio to double team Love. Love shot two of six in the second half. But he ended up getting 14 free throws and making them all in a series of official judgments the Bulls did not fully endorse. Though it’s not something you much mention in the NBA. Call the president names; but you better not question an NBA referee. Actually, to listen to Thibodeau you would think it was just a play here or there. So perhaps a little more defense here, a little better offense here and let’s see if the Timberwolves can avoid melting down yet again. But the Bulls would never get close enough. They trailed 23-20 after the first quarter, though Butler on the night the team gave out bobblehead dolls in his likeness showed confidence in his shot after a long slump. He appeared looser knowing he’s changed his hair style from the one the doll was modeling. He hit an early three and a pull up without the usual hesitation of late. It didn’t carry over to Tony Snell, who reverted to his uncertain play and zero for five on threes. Though Boozer had 24 shot attempts and Augustin 15, you more had the sense they were waiting for something to happen. They were more aggressive late, though without Hinrich and Noah the offense was brutal, slow (Ok, slower than usual) with not much movement and more isolation play. 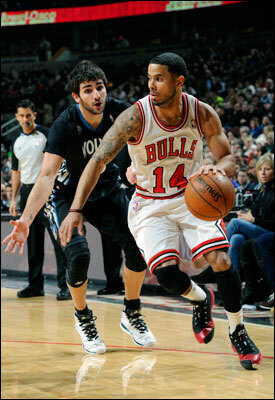 Augustin turned in another solid performance with 19 points and six assists. Though it’s understandable — to us more than Thibodeau — that without your two best players at running the offense it’s going to be difficult to get the usual movement. Augustin has done well picking it up in six weeks. But he’s relied mostly playing off Noah. Yes, the Timberwolves lost their center, Nikola Pekovic, to an Achilles injury in the first quarter. But they got a good lift from Ronny Turiaf with 14 points and seven rebounds. Still, Mohammed cancelled him out for the most part. The Bulls just had difficulty all game even deciding what they wanted to do. They only occasionally found Boozer in the post until late, and Gibson drew those two quick fouls early in the third quarter and had to go out, leaving Thibodeau to mix and match small lineups. 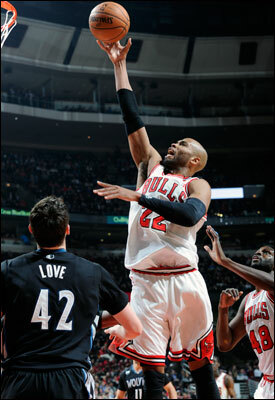 The Bulls did do a good job slowing down Love with those double teams after trailing 54-46 at halftime. They got within 68-63 late in the third quarter. But the offense would turn comical at times. Butler and Dunleavy collided on cuts a few times, which suggests not great spacing. And the Bulls were taking shots late even more than usual. Plus, the Timberwolves came out after halftime running Rubio at Augustin. Rubio scored three straight times on drives as the help was late or otherwise observing from afar. The Bulls adjusted to that and even with the Timberwolves shooting 31 percent in the third quarter, the Bulls remained behind 72-65 entering the fourth quarter. The Bulls failed to score on their first seven possessions of the fourth quarter as Mike James dribbled around way too much before teammates got the ball for late shots. The Timberwolves didn’t do much better and were vulnerable, scoring on two of their first seven possessions. But that was enough for an 80-69 lead with seven minutes left as Love returned. The Bulls were not going to get much more than 80 points the way they were going, which Love would offset with some free throw shooting. He put up big numbers again, and he proved a difficult matchup drawing Gibson out to defend his three point shooting. Some teams put smaller players on Love as teams used to do with Dirk Nowitzki to challenge him to go into the post. But Love has improved inside against smaller players, adept at drawing fouls. Though to watch him you’d still have him behind LaMarcus Aldridge and Blake Griffin as an inside postup force even with Griffin not considered much of one until lately. Though it’s been awhile since the Bulls have seen 30 points from someone in their box score. Actually since Deng did it in early December, just the second one all season. Yes, the little things. But missing that one big thing, Thing 1 these days without Rose and Deng. Because then you are missing the bump and the thump and the thump and the bump, big bumps and jumps and kicks and hops and big thumps that lead to all sorts of good tricks and baskets that anyone needs on a cold, wet and snowy day to make it good fun that is funny.